Welcome to our 12 Days of Christmas Blog Tour! Today is day three of the tour and the theme for today is Five Golden Rings and Six Geese of laying. 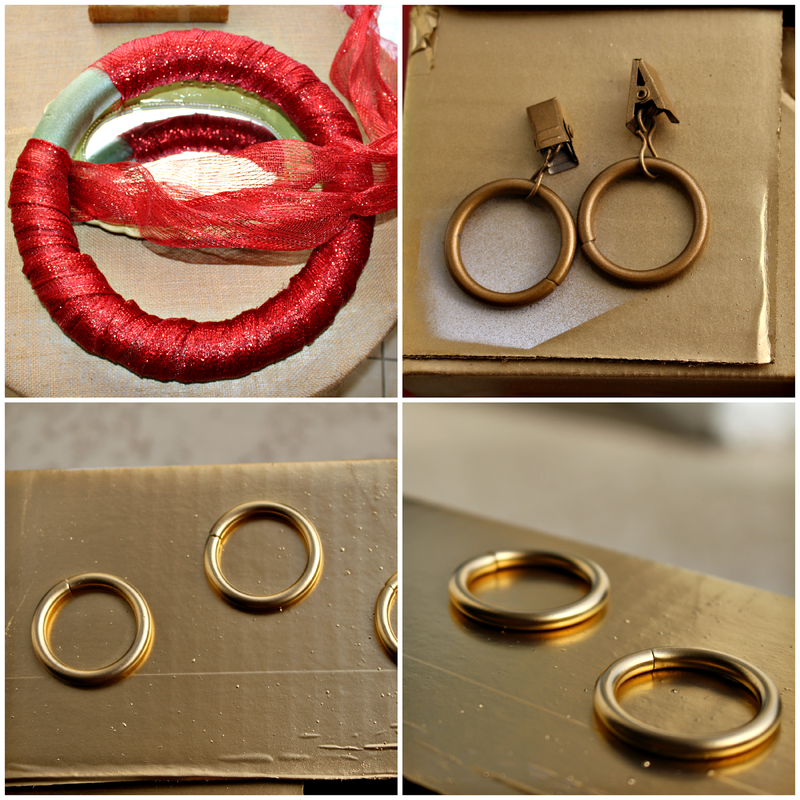 I chose the five golden rings and I will be showing you how I made this festive wreath. 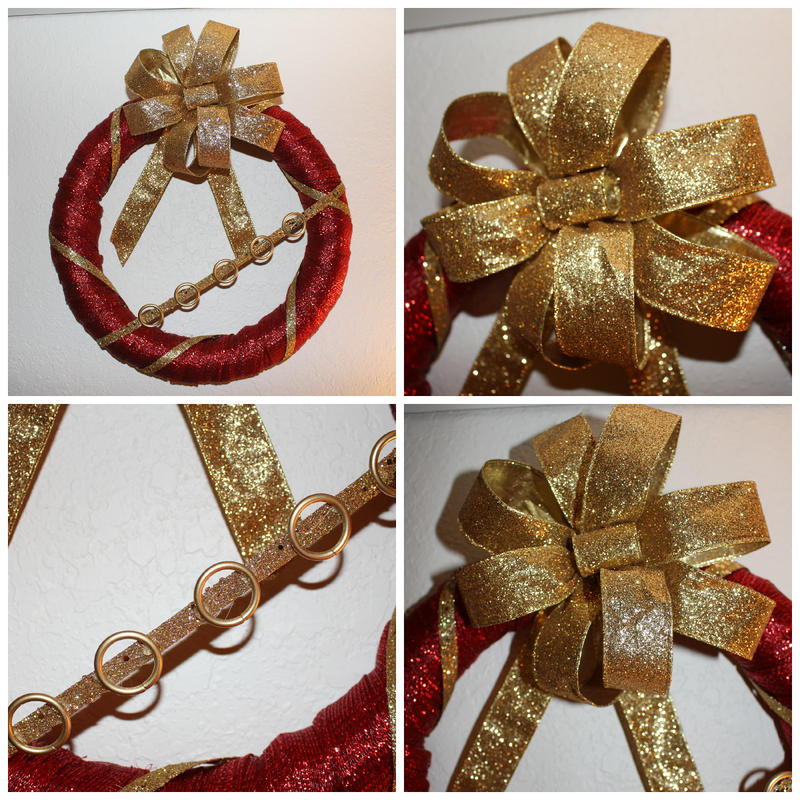 I started out with a foam wreath, red deco mesh, gold 1.5 inch ribbon, 3/8 inch gold ribbon and curtain rings. I wrapped the deco mesh around the foam wreath. Then I removed the clips off the rings and I sprayed painted the rings in brillant gold. Here is the finished wreath. Making this wreath was simple and anyone can do it. To see all my Christmas creations and other inspirations visit my Christmas board and follow me on Pinterest. You can go and visit my dear blog friends, who are sharing their creations all this week during our 12 Days of Christmas Tour. Make sure to stop by and if you missed day one and two of the 12 Days of Christmas tour, just scroll down below as well. Pretty gold and red wreath...very festive!! What a fun interpretation!!! So pretty, Vanessa! I love it! What a clever idea! So fun and festive! Very pretty Vanessa! I love gold and red together! You have lots of inspiration for Christmas ....I love the snowman pillow from a previous post too. Thanks for your visit and kind words on my blog. I am your newest follower now. Looks like you folks have Christmas all wrapped up with a big red bow! (or wreath :) ) Happy Holidays! Every time I pop over here I feel more and more like making things! I think Michaels is on my shopping list soon. Thanks! I've always loved that song, "Five golden riiiiings!" Your wreath has just the right amount of bling and the red really pops with the gold! Such a pretty & festive wreath!! You found a great way to incorporate five golden rings into a wreath. I like the red and gold combination. So clever! What a great way to create five golden rings--very creative. Festive and lovely! So creative! I never would have thought to interpret the theme like that! Great job Vanessa! :) Marry Christmas! So pretty Vanessa! Super cute way to use the red ribbon with the gold. I wouldn't have thought of using curtain hooks:) Pinning & Happy Holidays! The gold rings add so much to the wreath. Very pretty. Vanessa great job! I love how you incorporated the rings, it came out awesome~! Thanks Venessa for this awesome red and golden wreath tutorial. I too made some on my own. I still have some deco mesh left that I bought for wreaths creation from Papermart. I know deco mesh is a very versatile material that is excellent for a huge variety of projects. So may be I'll use them for some other project too. Thank you Venessa for this amazing blog post. I am your daily fan and I love your concept. God bless to you.